Weighing just 170g, but still capable of delivering usable light (1 lux) to 466m, the Carbon-2 is the ultimate motorsport lighting solution where space is at a premium. Available in two distinct lens options - Spot and Reeded, the diminutive size of the Carbon-2 makes it the ultimate corner lighting solution. At its core, the lighting performance of the Carbon-2 is driven by ultra-reflective vacuum-metallised boost optics, combined with a pair of high intensity 11W LEDs. The Spot and Reeded lens options give flexibility to match the distribution of light to specific applications, with the Reeded lens option also available for lights mounted in a vertical orientation. 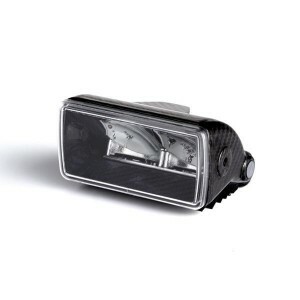 Through extensive testing and feedback at the very highest levels of rally, track, and off-road motorsports, the colour temperature of the LEDs has been carefully selected to provide maximum definition and sharpness. The unique design of both the housing and internal electronics, which includes rear facing LEDs, provides greater light utilisation, reduced scatter, and better vertical distribution of light beneficial during heavy braking and acceleration. The Carbon-2 is supplied with a pair of 3mm folded aluminium side brackets.